On August 25, four Vermont Air National Guard officers gathered in a planning room at the South Burlington base to war-game a hypothetical mission — destroying a nuclear plant in North Korea. Their primary weapon: two F-35s, the military's controversial new stealth attack planes. This sort of "whiteboard" exercise is a regular part of their training. But that day, the simulated world seemed uncomfortably close to the real one. Fewer than 24 hours earlier, North Korea had test-fired a ballistic missile toward Japan. It was yet another sign of the isolated country's dangerous belligerence. Could the F-35 evade North Korea's air defenses to destroy the nuclear plant in case of war? Could it do the job better, with fewer losses of pilots and planes, than the F-16 fighters it is scheduled to replace at the VTANG in 2019? My day job is running a life science company in Winooski, but my passion is flying airplanes and helicopters. So I have followed the national debate over whether the F-35 is necessary and reliable — or a waste of billions of dollars. The military has billed the single-seat, single-engine F-35 "Lightning II" Joint Strike Fighter as the answer to the increasingly sophisticated weapons in the arsenals of our potential enemies. The plane, the most expensive weapon in history, is equipped with advanced stealth technology that makes it invisible to most forms of radar. The F-35 has also generated heated local arguments about whether it is properly based in Chittenden County, where some people feel the plane will create unacceptable levels of noise. This summer, a federal judge dismissed opponents' latest challenge, apparently clearing the way for the F-35 to arrive here in three years. I asked the VTANG to take me behind the scenes to make its case for the aircraft. I hoped my flying experience, albeit in much simpler aircraft, would inform my reporting. I began with an assumption that the F-35 is likely a good idea, but with an open mind about whether it is capable of carrying out its mission and worth the time and billions invested in it. That's how I found myself "transported" to North Korea. Although the mission briefing was unclassified, it was not dumbed down. Even with my training and experience flying jet airplanes and turbine-powered helicopters, I was hanging on by the tail most of the time. And it was not just the dozens of acronyms and abbreviations that pepper military speech. Following the elaborate choreography of Air Force fighters and support aircraft required a real knack for rapid data assimilation. At times, the exercise felt as challenging as riding a unicycle while playing a high-speed game of chess. Capt. Chris Clements, an Air Force intelligence officer, began the briefing with an overview of the target objectives, assets and weapons, threats and contingency plans. Then Lt. Col. John Rahill, an F-16 instructor/pilot and mission commander for the operation, described the attack as it would be planned if pilots were flying the F-16, the Guard's current plane. Destroying the Yongbyon nuclear plant was categorized as high risk for the F-16, he told us, meaning there was a good chance some Guard airmen and women wouldn't make it home. At the very least, the mission would require a huge arsenal of aircraft, 20 in all: two Navy Super Hornet aircraft to jam enemy radar, eight F-15 fighters to clear away any North Korean fighter jets, eight F-16s to take out North Korean surface-to-air missiles (SAMs) and to destroy the nuclear plant, one AWAC command and control aircraft high above the battle to direct the attacking planes, and one Boeing 707-style plane to remotely gather electronic intelligence. Those last two qualified as big fat targets. "That's 40 to 55 people you are putting in the air," in danger, just to do control and intelligence, Rahill said. "That is not to mention the 20 people needed to fly the fighter-bomber aircraft; 60 to 75 people in total, all at risk." Then Rahill ran through a different scenario, substituting F-35s for the F-16s. This time the mission required just four aircraft: two F-35 fighter-bombers, each carrying two GPS-guided penetration bombs to destroy the nuclear plant; and two F-22 fighter jets to fend off any enemy fighters. The risk level for the F-35 version of the mission would be medium to low. Total personnel at risk: four pilots. Normally, no aircraft would be lost. They say the best offense is a good defense. In Air Force terms that means pilots on a bombing mission must neutralize the enemy's air defenses in order to destroy their targets and return home safely. But missile technology has improved dramatically, especially in places like Russia and China, since the U.S. Air Force launched the F-16 fighter jet. The plane is no longer a match for SAMs such as the Chinese-designed HQ-9, the VTANG pilots told me emphatically. And while no one is anticipating a war with Russia or China, their weapons technology could wind up in less stable countries such as Syria and North Korea. Lt. Col. Tony Marek, an F-16 instructor/pilot who helped conduct the whiteboard session, summed up the situation. Assuming North Korea has cutting-edge SAMS, there would be only one word for flying the F-16 on this mission, he said: "suicide." Twenty years after the U.S. military started work on the F-35, it remains a work in progress. When development started in November 1996, the military's concept for a next-generation fighter aircraft was really three airplanes — each a little different to satisfy the varying needs of the Air Force, Navy and Marine Corps, but sharing common components. The airplane also had to appeal to our allies around the world, whose requirements also varied. Selling the plane abroad would bring production numbers up, theoretically reducing the cost of each plane. Another challenge was the variety of missions required of the F-35. Initial draft specifications described a plane capable of engaging enemy aircraft, close air support of ground troops, suppression of enemy air defenses, and strategic and tactical bombing. The Marine version would need to be able to land and take off like a helicopter. The Navy wanted their version to be able to land and take off from aircraft carriers. So it came as no surprise to many early skeptics of the program that a design able to do all those things, with multiple masters running the show, would be over budget and behind schedule. What startled even the most die-hard detractors was the magnitude of the miss. The most recent numbers from the U.S. Government Accountability Office suggest that, by the time an operational Air Force version of the airplane is deployed, the cost will be more than $400 billion — $360 billion over original estimates. To date, only the Marine version has any significant flight time within an operational combat unit. The Air Force version was recently declared combat-ready, but even ardent supporters acknowledge that it will be a while before this variant, the F-35A, is able to do all the things it's supposed to do. The program already enjoys the unenviable distinction of being the most expensive and delayed procurement in Pentagon history — to date, more than eight years late with a cost likely to exceed $1 trillion by the time the airplane is retired from service some 60 years from now. There are other problems, too. Most of the savings associated with mandating commonality among the various versions of the airplane have disappeared. The ambitious goal of 70 percent common parts long ago went by the wayside. Twenty percent is closer to what we are likely to see, according to remarks from Air Force Lt. Gen. Christopher Bogdan, the Pentagon person responsible for running the F-35 program, at a defense conference last March in Washington, D.C. So it is not surprising that each airplane is now expected to cost $130 million, $50 million over the projection used to justify the program. To put this in perspective, the truly iconic World War II P-38 Lightning, from which the F-35's name is borrowed, cost just $1.3 million per airplane in 2016 dollars and took a mere three years to develop. And it was one of the most successful fighters in history. There have been additional concerns from within the program. The Pentagon has acknowledged reliability problems with the engine and the critical onboard sensor integration software. That software is supposed to make the multitude of data collected by remote sensors easier for the pilot to understand. Nevertheless, "I would be happier today knowing the pilots I am responsible for were in the F-35 aircraft doing the current mission than an F-16," said VTANG wing commander Col. Patrick Guinee. Even with its limitations, he said, the F-35 would be a better weapons system than the F-16. Part of the reason Guinee and other fliers are so positive about the F-35 is the way it fights compared to the F-16. To make their case, they offered me the chance to fly both, using the flight simulators on which military pilots train. A console replicates the cockpit. The F-16 has had so many incremental technology upgrades that just finding the right buttons and switches required enormous effort in a facsimile flight over Vermont and New York. At the same time, I had to act upon a hailstorm of information, integrating electronic countermeasures, defensive and offensive weapons, navigation, communication and coordination with other allied aircraft. Never mind just flying the plane. Having logged more than 1,000 hours in various models of business jet, I expected the F-16 to be mostly a faster, more agile version. And so it was. But the procedure to deploy a 500-pound, laser-guided bomb, for example, was pretty much a full-time job. Clumsily operating the multitude of switches and buttons needed to complete the task, I managed to take out the VTANG hangar. Boom! Thankfully, no one was shooting back at me. 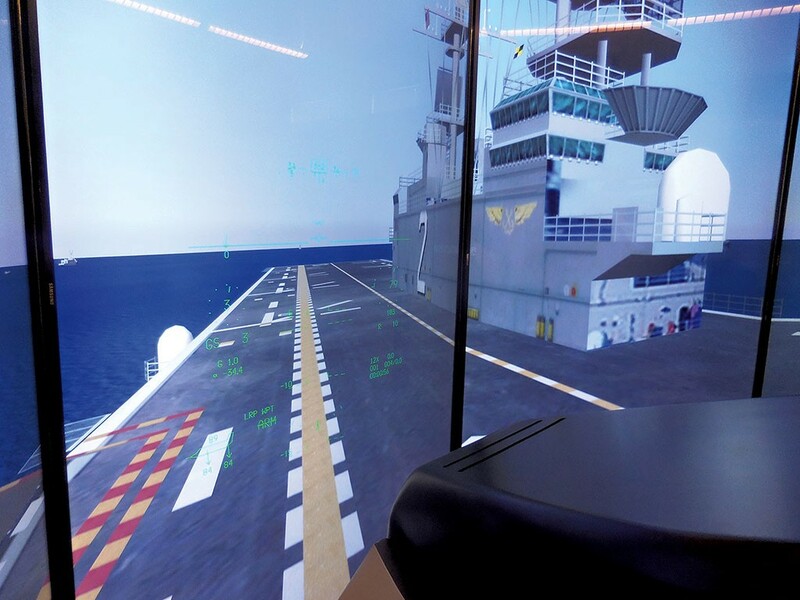 A few days later, I was in an F-35 simulator in front of a dashboard that looked much like an oversize iPad. A big screen in front of the console displayed my environment: blue sky and high clouds 25,000 feet above the ground. Below was not the Adirondacks but a well-defended stretch of darkening desert. The F-35 is built to greatly reduce the pilot's workload, with onboard software integrating much of the information I needed to complete the mission: to destroy an imagined high-value enemy asset. Unlike the F-16 with its byzantine layout of controls and displays, the F-35's cockpit is very clean. In addition to the single screen, I had a stick on the right side to control pitch and roll, a throttle on the left, a lever to raise and lower the landing gear, and a handle to eject the pilot. Conventional rudder pedals on the floor controlled yaw — much the same way a boat rudder controls direction of travel on the water. Everything else I needed I could read off the computer touch screen. It gave me only the most important information so I could focus on critical challenges, such as remaining stealthy and taking out the bad guys. At moments, I felt like I was playing an elaborate video game in which I could call on an array of apps that kept me updated on my weapons inventory, engine status, threats and targets. The most important app of all — stealth status — revealed exactly how difficult it would be for the enemy to detect me. We were flying too high and too fast to be concerned about more conventional threats, such as those posed by anti-aircraft artillery or the older Russian-designed missiles. But I was plenty worried about a particularly menacing type of SAM. Although it hadn't been identified in the pre-sortie briefing, I assumed it would be the Chinese-designed HQ-9 or something equally dangerous. Why else would we need the stealth of the F-35? 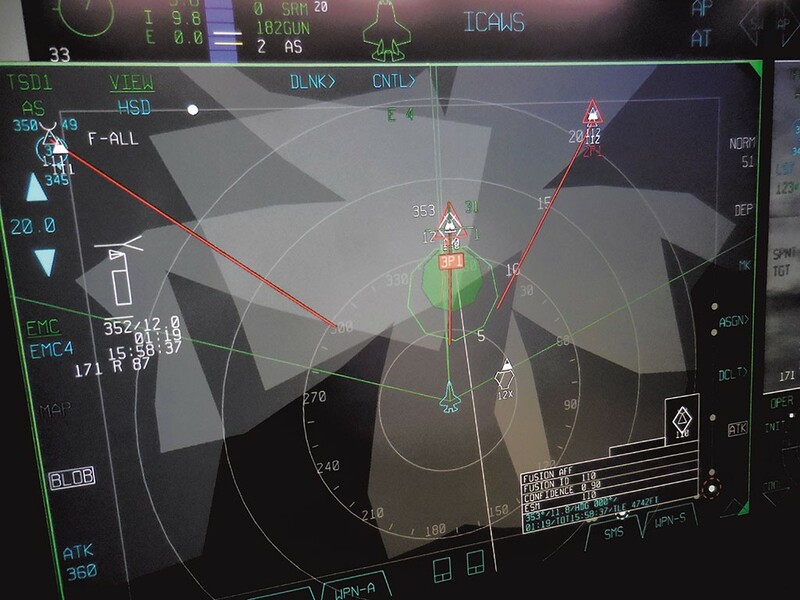 Now with 75 nautical miles to go, I could see my position relative to the target on the F-35's tactical display. At my speed of about 600 miles an hour, it would be less than a minute before I reached the "launch acceptability region," the point in space where my GPS-guided bomb would have sufficient height, energy, impact angle and attack angle to destroy the threat. While my wingman focused on electronic countermeasures to confuse any active enemy shooters, I set up for the kill. Moving the cursor over the triangularly shaped objective on the screen, I added the target to the top of the shoot list. 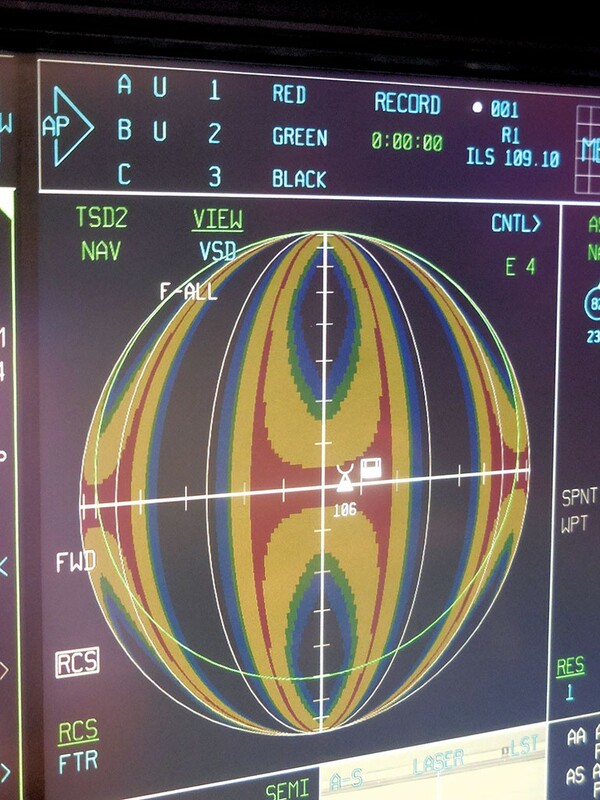 Worrisome, though, was the short distance between the solid green-lined, nine-sided figure on the screen that depicted the launch acceptability region and the dangerous airspace where I might be detected. This was depicted as a gray, flower-like blob on the screen. My tactical app showed that, even with all those clever stealth systems, I would need to risk being seen by the enemy, most likely when releasing the bomb. During that brief moment when the bay doors open to launch the bomb, the F-35 becomes detectable by ground radar and a giant target for surface-to-air missiles, not to mention enemy fighters. I didn't want to waste any time getting out of town once I'd done the job. I was never threatened by enemy aircraft during the simulator session, a blessing given that I was pretty busy just flying and setting up to hit the target. Still, I wondered how well the airplane would perform in a dogfight. The Air Force acknowledges that a clean F-16, free of externally mounted weapons, pods, tanks, etc., is probably better in an air-to-air battle. But that's not the way the mission planners and pilots expect to operate the F-35. "If you get into a dogfight with the F-35, somebody made a mistake. It's like having a knife fight in a telephone booth — very unpredictable," said Rahill, the VTANG instructor-pilot. "The pilot uses onboard long-range sensors and weapons to destroy the enemy aircraft before ever being seen. The combination of stealth and superior electronic warfare systems makes the F-35 both more lethal and safer." With only seconds to firing, I watched the target range countdown clock as I positioned my thumb over the stick's launch button. I must admit that it was quite a rush to push the red button on the stick and see the weapons app wake up, fleetingly showing a bomb icon blink on the upper-left corner of the screen. Then it was gone and away with an audible clunk as the bomb bay doors opened and then quickly slammed shut. Watching on my jet's tactical display, I could see the bomb gliding toward the target. I immediately started a sharp, Top Gun-style 7 to 8 g-force turn away from any SAM threat while the clock on my screen counted down: 10, 9, 8 ... 3, 2, 1, ka-boom! Thanks to the F-35's special camera app, I watched my target exploding on the ground while flying in the opposite direction at near supersonic speed. The plane and I returned safely to our base. 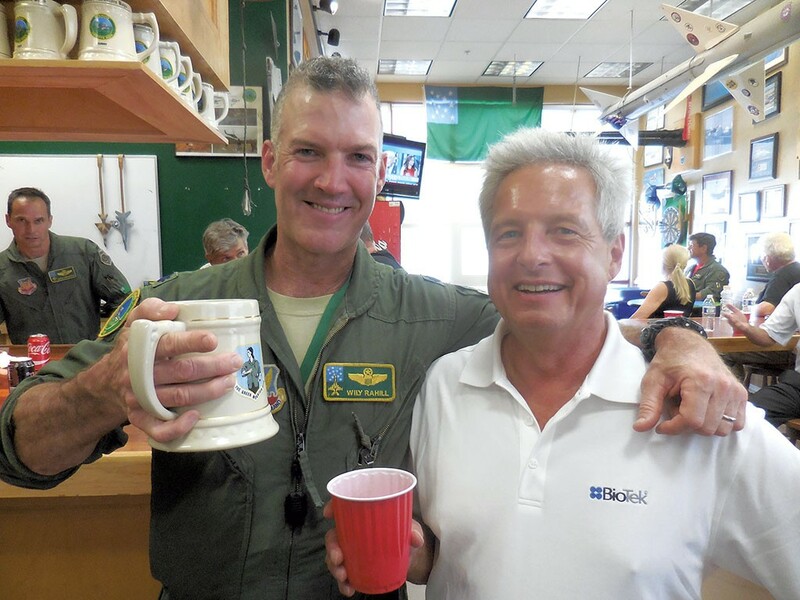 According to Lt. Col. Chris Caputo, who is charged with integration of the F-35 at the South Burlington base, this would not have happened if I'd been flying an F-16. "We absolutely need the F-35 with its superior technology to accomplish our mission and actually live to tell about it," he said. If the simulator's stealth performance is representative, F-35 attacks on enemy air defenses will be devastatingly effective. Engaging multiple ground and air targets during my flight, only once was I detected. The combination of electronic countermeasures, external airframe geometry, protective coatings and a bunch of secret things make the F-35 difficult to track. Only when the plane got very, very close to its SAM ground target or airborne enemy aircraft was there danger. The pilot can tell by observing varying degrees of gray color on the moving tactical map. More gray equals less stealth. Less equals more. Stay out of the gray areas, and you are invisible. 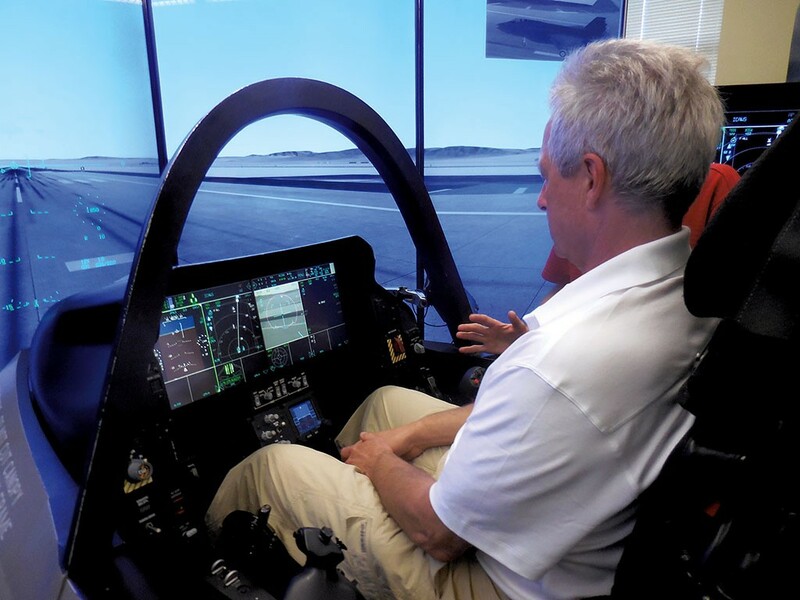 Critics argue that it would be better, cheaper and safer to use drones or artificial-intelligence-controlled aircraft to carry out missions like the one I flew in the F-35 simulator. Guinee argued that this technology is unproven for many of the jobs the F-35 is intended to conduct. At the moment, drones lack stealth and do not fly high enough or fast enough. "Literally, they would fall out of the sky like flies," he said. They also lack the ability to make the tough calls that depend on a pilot, such as deciding whether a potential target is friend or foe. But, Guinee acknowledged, "Someday unmanned aircraft may be able to perform this role." The jury is still out as to whether the F-35 will become the truly renaissance aircraft that has been promised. The program's secret nature makes it difficult to know for sure if the multitude of serious problems encountered during development and testing foretells more problems or were the kind of initial difficulties involved in tackling any big technical challenge. Critics including retired Air Force Col. Rosanne Greco of South Burlington, leader of the local Stop the F-35 Coalition, have come to one conclusion. "In addition to being grossly over budget, decades behind in development, and having complicated and costly maintenance problems, the F-35 is the only new fighter the Air Force has," she said. "The military plan to make one aircraft accomplish three very different missions sounded great ... except it hasn't worked." If drones do become the weapon of choice in the future, the F-35 may be the last manned fighter to join the U.S military arsenal. The airplane's introduction may signal the iconic fighter pilot's last stand. While Guard pilots acknowledge the F-35 isn't perfect and won't be for a long time, they argue that, even with its problems, the plane will be more effective against modern enemies than what they have now. We had better hope they are right. As the critics point out, there really isn't a Plan B.
Adam L. Alpert of Milton is an internationally published aviation journalist. He is also vice president of BioTek Instruments in Winooski. Correction, October 24, 2016: An earlier version of this story used an incorrect acronym for the Vermont Air National Guard. The original print version of this article was headlined "View From the Cockpit"